Plan to attend the largest gathering of plant scientists in years? The schedule of this Joint Congress will consist of a combined set of scientific sessions and events from all of the above societies. Attendees will be able to participate in any of the events available. This is a unique opportunity for attendees to participate in events provided by the other societies as well as the normal Botany format. It will encourage the sharing of plant science across many research areas. The meeting will feature special joint sessions, mini and full symposia, workshops, exhibits and poster sessions as well as field trips and the 6th Annual Education and Outreach Forum. Find your talk, plan your week! Below is a list of hotels in close proximity to the Hilton Chicago. 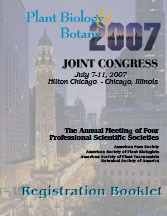 Plant Biology & Botany 2007 has NOT negotiated rates or room blocks with the following hotels. Feel free to use any other internet avenues to find alternative housing options. If you drive to Chicago and don't want to pay hotel prices we have a attached a map of some nearby parking locations. Chicago Parking Map. Click on the "P" and a phone number and general information about the lot will appear....you will need to contact them for their current rates. » Want to share expenses? » Interested in serving as a student worker? » Need a Letter of Invitation? » ASPB Travel Grant Application Members of all societies are invited to apply.